We received a Ben and Holly Magical light and sound tri-scooter to review from Entertainment One. Top Ender and Big Boy love Ben and Holly's Little Kingdom, as do their cousins and when the Ben and Holly Magical light and sound tri-scooter was sent for us to review from Entertainment One, I knew that it would be their cousins that would get the most enjoyment out of it, so I asked my sister if it would be okay if I could spoil them a little with the Scooter as a gift. Luckily she said yes and so they are now the proud owners of the tri-scooter... or at least they will be come 3pm Sunday afternoon when we take it round! I couldn't send it to my niece's without having a look at the tri-scooter first though. I think that it looks funky as it has a purple and pink colour scheme and with the lights and sounds from the show activated by Holly's magic wand it sounds like it would be quite fun to ride on. I just wish I was small as I would have loved to have owned this when I was young! 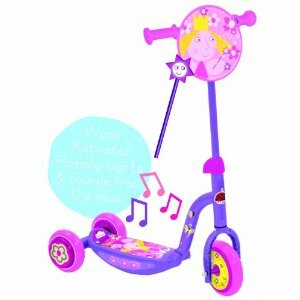 The RRP for the Magical light and sound tri-scooter is £39.99 and Ben and Holly's Little Kingdom products are available at all good retailers and you can find them on Facebook too.